(FOR IMMEDIATE RELEASE--January 22) Eagles Of Death Metal has announced the release of the second wave of the Play It Forward EODM Campaign that debuted December 18, 2015 with an amazing assortment of covers of “I Love You All The Time” from the band's current album Zipper Down. For every cover sold, the band pledges to donate 100% of its publishing income to The Sweet Stuff Foundation, the non-profit organization founded in 2013 by EODM co-founder Joshua Homme to provide assistance to musicians and their families in times of need, as well as musical education and gear for the next generation. Participating artists were also asked to donate the money generated from sales of the song to the charity. 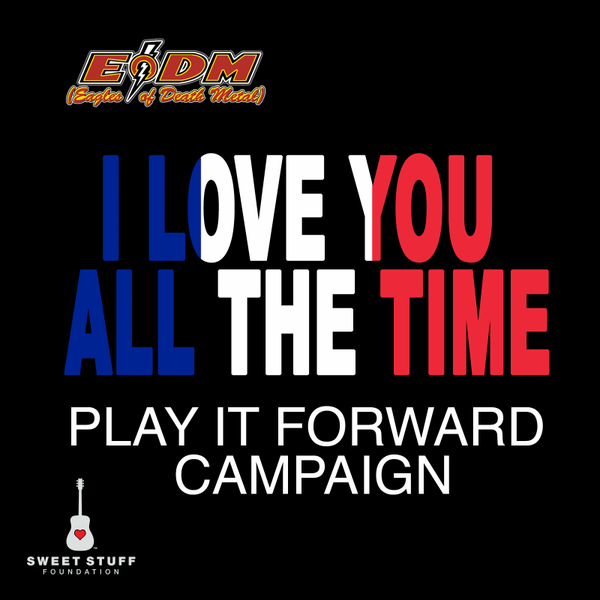 The Play It Forward EODM Campaign was first inspired by none other than Duran Duran who reached out with an immediate and sincere act of musical solidarity in the aftermath of the November 13, 2015 attacks in Paris that took so many lives at Eagles Of Death Metal’s show that night at Le Bataclan: Spurred by a fan-led campaign to push Eagles Of Death Metal’s cover of Duran Duran’s classic “Save A Prayer” to #1 in the UK, Simon LeBon tweeted that the new romantic icons would donate their share of royalties from the track to charity. In the weeks that followed, Eagles Of Death Metal asked artists the world over to cover “I Love You All The Time," pledging to donate 100% of its publishing income to The Sweet Stuff Foundation. With invaluable support from TuneCore, the first wave of “I Love You All The Time” renditions were made available, with contributions from artists as diverse as Florence + The Machine (featuring The Maccabees), Kings Of Leon, Savages, My Morning Jacket, Imagine Dragons, Jimmy Eat World, the Dean Ween Group and more. The second round of covers are available now. Yet more additional versions are forthcoming and will be announced as they are confirmed. Those wishing to donate should go to http://playitforwardeodm.com for information on how to do so. With cooperation from Fondation de France: www.fondationdefrance.org and FENVAC: www.fenvac.org, Play It Forward EODM Campaign donations to Sweet Stuff will aid the surviving family members of those killed in the November 13 Paris attacks—as well as the family of slain EODM crew member Nick Alexander. For more information on The Sweet Stuff Foundation, go to www.thesweetstufffoundation.org.